GIPO was founded in 2000 and aims to offer to vocational guidance specialists a space to debate and discuss more recent and innovative concepts, ideas, methodology in career development theory, research and practice in order to foster the development of vocational field. It publish articles on career counseling, individual and organizational career development, career development of special needs populations, career development and family, career, work and leisure, career education, and career management. It is published three times at year. 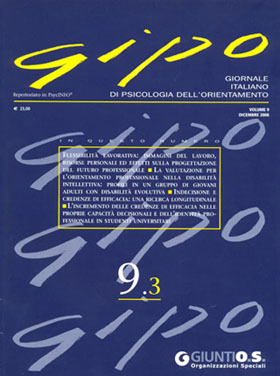 GIPO consists of three section: Studies and researches where theoretical, methodological or empirical articles are published; Instruments and applications where assessment instruments, training programs and case-studies are presented; International review where the translation of relevant articles, published in International journals is provided; review of scientific international journals, conferences and events; review of new publications.